No matter when grilling season comes, or if it never ends, you’ll be ready with our best BBQ brands at Walmart. For some Canadians, BBQ weather is all year round. Others wait patiently for the snow to melt before they tie on an apron. Here are some of the best BBQ brands, and even a few of the best BBQ accessories, you’ll find at Walmart.ca. 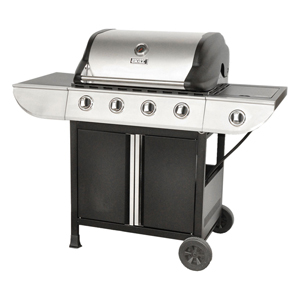 Exclusive to Walmart, Backyard Grill specializes in gas and charcoal grills. Sizes range from portable gas and charcoal grills (for camping or day trips) to propane BBQs with 5-burners and a 28-burger cooking space (ideal for family reunions). This company offers everything you need for all types of grilling, from skewers, to marinade trays and extendible cooking forks for roasting marshmallows. Backyard Grill can also help you keep your BBQ clean, with biodegradable solutions that help to eliminate grease. If you’re looking for a hardwood pellet BBQ or smoker, look to Pit Boss. Their 100% natural pellets deliver a wood-smoke flavour while you cook. Pit Boss pellets have no artificial flavours, spray scents, glues or chemicals. Applying high pressure to sawdust during production forces natural juice in the wood to bind the pellets together with a flavour that is unique to each blend. Hickory produces a strong, smoky taste, great for beef, pork, poultry and vegetables. Other flavours include apple and whiskey barrel. Pellets are sold in 40 lb. bags. Pit Boss is a family company, started by a dad and his two sons in Phoenix, Arizona. Fans of the brand are called Pit Boss Nation, and they’re thousands strong on social media, sharing recipes and tips for great grilling. Celebrity fans, called Pit Masters, include Willie Robertson of Duck Dynasty fame. Char-Griller was founded several decades ago by a brother and sister from Georgia who still operate the company today. It began by offering a barrel-style charcoal grill and expanded over the years to include dual grillers (charcoal and gas), a pellet grill and its eye-catching and practical kamado grills. Kamado is a Japanese word that means stove, but a kamado grill is so much more. Shaped like an egg, it doesn’t take up a lot of room, boasts even heat and functions as a cooker and a smoker in one. These grillers are engineered with insulated double-walled steel with cast-iron cooking grates to help it last longer than traditional BBQs. Kamados come in a range of sizes. One of the original outdoor cooking companies, Char-Broil brought out its first charcoal grill in 1948, helping to lure families out of the kitchen and into the backyard at a time when that wasn’t the norm. In 1984, one of their machines earned the title “World’s Best BBQ” as chosen by the Book of Bests, and that spurred them on to continue innovating. This company now makes charcoal, gas, hybrid and electric grills as well as their Tru-Infrared gas grills. Their product line also includes accessories like grill covers. Dyna-Glo is the grilling division of GHP Group—a manufacturing company based in Illinois that knows how to bring heat to your home, inside and out! 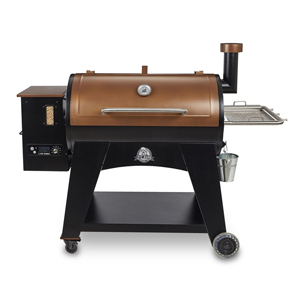 Electric, gas, charcoal, propane, dual fuel—Dyna-Glo offers all types of grills and smokers for all kinds of cooks. They also make patio space heaters so you can extend the season of eating al fresco. With affordable prices and great quality, Backyard Grill is Walmart’s biggest supplier and best-seller of BBQs and accessories. Here are some of the company’s most popular items to get your grilling off to a good (and low cost) start. This natural wood scraper adapts to the shape of your grill to remove burned-on food in a smooth motion. Its metal tooth fits between the grates, securing the scraper as you clean. It also features a flange that is used to help scrape hard to reach places and lift hot grills. Two beef and two poultry thermometers are designed with a heavy-duty stainless steel probe. Each features an easy-to-read dial. A convenient storage holder is included. This versatile 11- by 14-inch griddle can be used on the grill for frying, searing and blackening food. You can take it inside for use on the stove and in the oven. It’s also great for making stir-fried veggies and seafood, too. This deep-dish griddle with handles is made of stainless steel for added durability. Help protect your grill from dust, dirt and the elements with this cover that’s tailored to fit all types of BBQs up to 60-inches wide. Sturdy hook-and-loop closures help keep the cover in place. Now that you’ve familiarized yourself with the best BBQ brands at Walmart, you’re ready to narrow your search for the best BBQ and accessories to suit your needs. You’ll be grilling in no time! See also: Winner! Winner! Pancakes for Dinner!